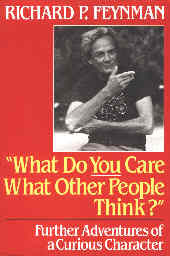 The saddest part of this book is the realization that there will be no more books from this amazing Mr. Feynman. He won the Nobel Prize in physics for his famous Feynman diagrams. These are diagrams that explain the structure of matter by showing how particles (electrons) travelling forward in time may be thought of as anti-particles (positrons) traveling backwards in time. My insight on how this makes sense stems from watching a motorcyclist traveling down a road winding alongside a hill. As I reversed the direction of time (via Laserdisc), the cyclist moved back down the left side of the road (you must imagine that your viewpoint is on the rear seat of the cycle looking in its now forward traveling direction). The attribute of electron versus positron is as simple as the left or right handedness that switches when time is considered as a variable that can have a positive and negative value (or direction). The first chapter on "How to Make a Scientist" is worth the price of the book. He tells how his father bought colored tile seconds and stacked them with Richard, teaching him thereby to recognize patterns as a basic mathematical process. His mother would say "Let him put a blue if he wants," focusing on the human values (feelings) of the child and the father would say, "No, I'm teaching him basic mathematical operations." The anecdote teaches that the really important learnings are simple ones, if they are presented at the opportune age. A small step for a child to stack colored tiles, a large leap for mankind to stack eight colors of quarks into a proton. The second half of the book covers his fun with NASA and the Challenger investigation. His press conference, his histrionics with the ice water and O-rings turned the NASA investigation in the right direction. In 2003, another shuttle has an accident, the Columbia this time, upon re-entry. Another investigation awaits. John McQuaid in the Times-Picayune on February 5, 2003 wrote that Feynman's "simple experiment" on the NASA panel solved the Challenger problem and added, "Now a similar panel is investigating Saturday's Columbia disaster . . ." I don't it would be hyperbole to say that there will never be another "similar panel" because there will never be another genius like Richard Feynman. To do such a simple experiment in front of the eyes of world on such a prestigious panel required a genius and a genius who didn't "care what other people think" — in other words, it took a Richard Feynman. If Richard had any weakness, it was his love of physics. To paraphrase the fairy in Gilbert & Sullivan operetta, Iolanthe, "he had a weakness for physics and the weakness was so strong."